The Ztylus 4-in-1 lens kits make iPhone cameras even more powerful. You’ll be ready to take the perfect shot wherever you go without carrying around a lot of bulk. Each slim and durable phone case has a removable 4-in-1 module called the Revolver. This part includes wide-angle, macro, fisheye, and circular polarization lenses to enhance every photo you snap. Let’s review both the Metal and Lite Series so you can choose the best Ztylus for your phone. Let’s start with the premium Metal Series Ztylus. It’s simple but elegant. Made from rugged polycarbonate plastic with metal accents, it comes with features like you’ve never seen before in a smartphone case. First off, the interior of the case is textured to softly cradle your phone without scratching it. Then there is a removable kickstand that props up your iPhone for hands-free viewing. Second, there is a metal disc plate that unscrews so something even cooler can take its place–a unique lens attachment called the Revolver. This machined aluminum alloy attachment wheel hides away wide-angle, macro, fisheye, and circular polarization lenses. The Revolver rotates so that each one of the four lenses can click into place over the phone’s rear camera lens. With just one phone case you can greatly expand the capability of your iPhone. While the iSight camera built into the iPhone is very good, the lenses make it even better. For example, the iPhone 6 and 6s have small f/2.2 apertures. If you wanted to take a wide-angle picture, like a landscape with a group of people, where both your foreground and background features are equally sharp, this is not the ideal aperture for that purpose. The Ztylus wide-angle lens makes up for that lack. You can fit a lot more into the frame than you could before. Meanwhile, the macro lens is very useful for up close shots, like when you want to show every detail of a flower. You can take pretty decent macros with the regular iSight camera lens, but the Ztylus macro enhances it greatly. It’s a 10x macro with an focusing distance of just 0.71-inch (18mm). You’ll get grains of pollen on stamens with a lovely bokeh blur behind the petals. The fisheye lens gives you a 180-degree rounded and distorted image, fun for pictures of doggy noses and so forth. The CPL, or circular polarization lens, reduces glare off of reflective surfaces and it makes the sky look so, so blue. This is the lens you’ll want to use if you’re photographing your shiny new car or filming at the lake on a sunny day. 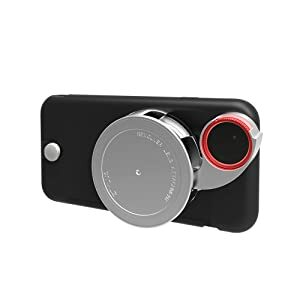 After your photography session is done, the Revolver attachment can be removed and replaced by the disc, restoring the the phone to its slender profile so it fits in your pocket. The Metal Series case fits snug, but you can still use a screen protector film over your display. While some other companies offer just a lens kit, we like the fact that the Ztylus is an all-in-one solution. It comes with a 1-year limited warranty. You might be curious now about the Ztylus Lite camera kit. We’ll review the Lite case for iPhone 6 with a 4.7-inch screen. When you select the Ztylus you want, whether it’s the Lite or the Metal series, please pay attention that it’s made to fit your phone and not the Plus version. Like the Metal series, the Lite is based on a durable polycarbonate cover that protects your phone. While the outside is tough, the inside is textured to protect your iPhone from scatches. The main difference between this case and the Metal is that there are no hand-polished metal accents on the outside. But the Lite does sport a metal kickstand so you can safely prop up your iPhone to view the screen hands-free. It also has a place to mount the Revolver 4-in-1 lens system. That attachment includes the wide angle, fisheye, macro, and circular polarization lenses. It’s so easy to use this Ztylus camera kit. Simply rotate the Revolver and flip out the lens you want. 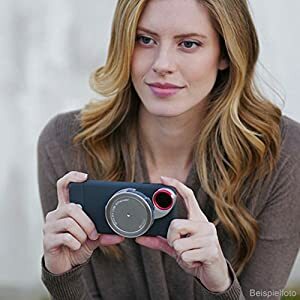 It clicks into place right over your iPhone lens. You don’t need to struggle to slide it into position like some clip-on camera lenses for smartphones. Ztylus says each lens is made from high grade optical glass that’s ground and polished to exact specifications. Then each lens is mounted into an anodized aluminum alloy housing. This makes for beautiful, clear photos and lenses that can stand up to repeated use. Whether you choose the Ztylus Metal Series case or the Lite, the only difference is cosmetic. You’ll still have a high quality camera kit that will extend the capabilities of your iPhone for photography and videography. If you prefer the elegant accents on the Metal Series, by all means, do get that case. Otherwise, you may save a little by going with the Ztylus Lite. The most important decision is choosing the correct size for your phone. Take your phone everywhere and learn to swipe open the Camera app without unlocking your phone. It will save precious seconds so you don’t miss the shot. Tap on the screen to focus, then slide your finger up or down to change the brightness. Lock the focus point by tapping and holding on the screen until contracting rectangles appear. Tap anywhere else to unlock the focus. For no shake photos (especially nice in low light settings), put the iPhone on a tripod and use the volume control button on your headphones to trigger the shot. Another option is to use the self-timer. Just got a lens from roadeavour and im loving it, but i might try this one too. Thanks! Thanks for your comment. Can you share with us your experience when using the product? bathtub to suit your needs, the good way to pamper yourself with. and family if they’d lie to recommend anyone to you.